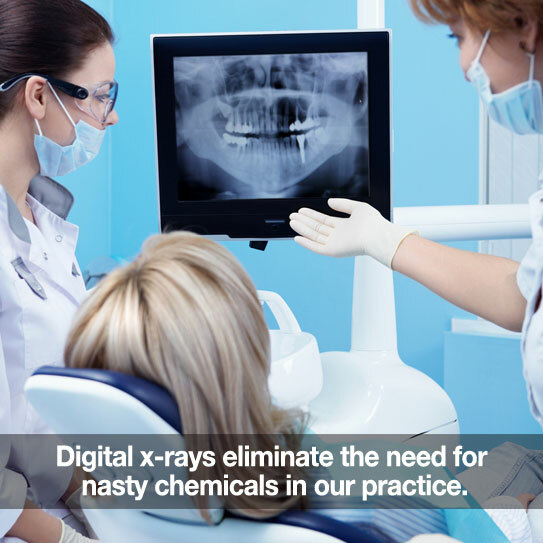 DENTAL X-RAYS ARE AN important part of your oral health care. They allow us to detect and diagnose problems that are not visible clinically. We take them only when we are given permission and only when you are due for them. We get images with higher resolution, which we can zoom in on, enhance, and duplicate. They are stored in our computers and years from now they will not fade like the old fashion processing solutions allowed. Because Digital images are instantly available—we can just pop them up on the screen right away to discuss them with you, which saves you time. Lastly, we can email them easily to anyone within minutes. Our office switched to digital x-rays several years ago. The entire staff finds it one of the best technology advances we have ever incorporated into the practice. It is a great way to educate and show patients on the computer screens that are installed in every treatment room.